Horncastle headed to County Championships! 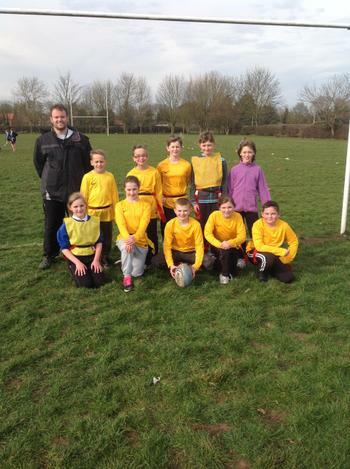 On Wednesday 11th March, 10 children from Year 6 headed to Alford to engage 13 other schools in a Tag Rugby competition. Despite just 3 short sessions to prepare, we set off for the festival in high spirits. Our first game against Burgh Le Marsh looked a tough one but a try in the first 5 seconds from Alfie Melton settled the nerves and with 1 further try from man of the match Alfie and 1 from Shannon Bullers, Horncastle eased through their first game 3-0. We eased through the next 2 games against Willoughby (4-0) and Withern (5-0) and Horncastle had scored a total of 12 unanswered tries in their first 3 games, putting them in a strong position to win the group. James Smith had been potent force on the wing in the first 3 games, coming from deep on the shoulder of his team mates to score 6 wonderful tries, but it was time for a rest. In our final group match we came across a formidable opponent in Woodhall Spa 2. We went down 4-2 but had done enough with tries from Alice Kemp and Jacob Fanthorpe to win our group on points difference and the final awaited us next! The final was a hard fought encounter between 2 great sides. With some dubious refereeing decisions (2 tries awarded to us but taken away!) we lost 3-1. However, the mighty Horncastle had done enough to earn a place at the county championships on 21st May 2015 in Lincoln. A huge well done to all the children involved in the Tag Rugby Competition, we are all immensely Proud of you….And good luck in the County Championships!